TRENTON, N.J. (CNS) — When Brian Siemann came into the world, he did so with three sisters. He was also the only one of the quadruplets who lost a third of his blood when he was six days old due to hospital negligence, leaving him paralyzed him from the waist down. It would have been easy to wilt under such devastation, but the Siemann family had a weapon to fight the depression. Now 26, the 2008 graduate of Notre Dame High in Lawrenceville, New Jersey, is at the Paralympics — his second — in Rio de Janeiro. “Going to church and having a constant in terms of knowing you can turn to God and rely on his support when you’re going through trying times is a calming presence,” Siemann said from his Illinois home before leaving for the Sept. 7-18 Paralympics. He said although he has turned to God a lot over the years, he prefers to keep his faith more private. Siemann and his three sisters — Amanda, Maria and Jessica — attended Catholic school. He was always in a classroom with one of his sisters, and one of them or his older brother, John, would carry his books through the hall. But they did not baby him. His wheelchair racing started as a freshman at Notre Dame, when track coach Joe McLaughlin encouraged him to come out for the team. “He said, ‘If you’re willing to give it a go, I will, too. So I went out, not knowing what I signed up for,” Siemann said. The coach hooked him up with the Mountainside Lightning Wheels, a wheelchair-racing club that taught him the nuances of how to race. McLaughlin also helped spearhead a fundraising effort to buy Siemann his first racing chair for $5,000. The New Jersey State Interscholastic Athletic Association allows wheelchair competition in its Meet of Champions, and Siemann dominated by winning gold medals in the 100, 400, 800 and 1,600 meters all four years of high school. He set the state record of 4:09 in the mile. Siemann decided to attend the University of Illinois because the U.S. Wheelchair Athletes training center is based there. After four years at the training center, Siemann made the 2012 Paralympic team and finished sixth in the 100 meters and eighth in the 800. That same year he won gold medals in the 100 and 200 at the U.S. Paralympic Nationals. This year he qualified for the 100, 400 and 800 in Rio. 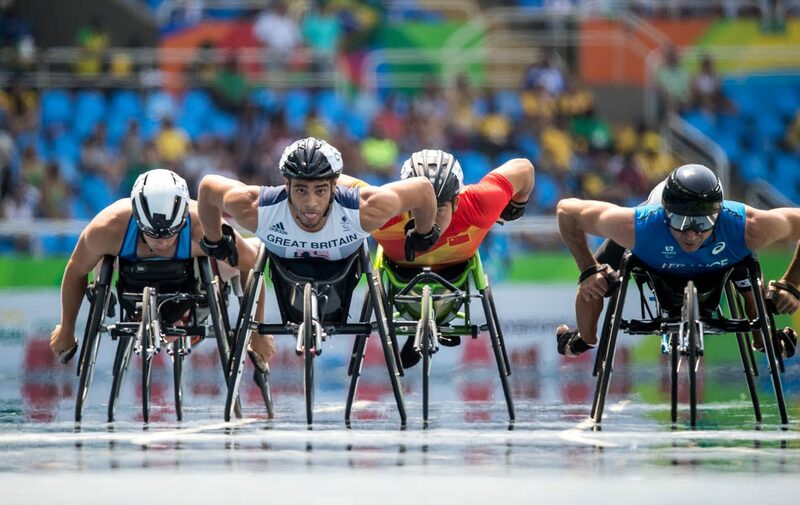 Siemann is putting his dreams of being a full-time teacher on hold for the time being, as he will also attempt to compete in the 2020 Paralympics in Tokyo. Most wheelchair athletes hit their prime at age 30, so he plans to remain in Illinois. Fisher is a correspondent for the Trenton Monitor, a bi-weekly newspaper produced by the Diocese of Trenton, New Jersey.